Aboriginal people occupied this place for untold generations. This land is part of a deeper story about the immediate locale and the cosmos itself. The people who identify as speakers of Woiwurrung and Boonwurrung languages (and the respective variants to these names), are part of the confederate Kulin nation and have a deep attachment to the Melbourne area, and in the case of Fishermans Bend, specifically the sand flats at the delta of the Yarra River, and the coastal edges around Hobsons Bay. This was a smaller bay to the north of the larger bay known as Nerm or Nairm, the Boonwurrung word for Port Phillip Bay. The use of this place by Aboriginal people can be understood by drawing on the knowledge of Traditional Owners, from archaeological investigation, and from fragmentary documentary records. While this is an incomplete picture, it is a starting point in understanding the earliest human occupation of this place. Sea level was significantly lower up to c.7000–10,000 years ago to the extent that the basin of Port Phillip Bay was exposed and occupied. Going back deeper in time, around 12,000–13,000 years ago, there was a land connection between Victoria and Tasmania. Sea level rise occurred gradually until the land bridge connecting Victoria with the north coast of Tasmania was lost, and the open plains of Port Phillip Bay were also covered by the sea. Traditional knowledge passed down by the Boonwurrung elder Benbow, and by countless generations before him, told of the time when Port Phillip Bay — Nerm — was land rather than water, and formed a vast hunting ground where kangaroos abounded, and when the Yarra River emptied into the ocean at Port Phillip Heads.6 There are different stories about the flooding of Nerm, and what triggered this dramatic and dangerous phenomena; some stories suggest it was because the ancestor spirits were angry and sought vengeance, and the flood came as a punishment. In Boonwurrung tradition it was a time of chaos and upheaval. The Yarra had previously followed a much longer course across Port Phillip Bay before emptying into the sea, and evidence of this ancient river bed can be detected on the sea floor today. Deep in the past, the present study area would have sat a long way inland from the mouth of the Yarra. As the ocean encroached on the land, from around c.7000–10,000 years ago, Aboriginal people adapted accordingly. Evidence suggests that the Fishermans Bend area and a large part of central Melbourne was still under water around 4000 years ago before the waters receded. This watery country with its salt water lagoons, sandy scrubland and dense thickets of tea tree, was rich in food sources, not only fish and shellfish, but also a variety of animals and plant foods. Aboriginal people used the area to hunt game, mainly kangaroo but also smaller marsupials. They fished and hunted in their allocated area of land, and at certain times of the year they came together to meet up with other groups that made up the wider Kulin nation. 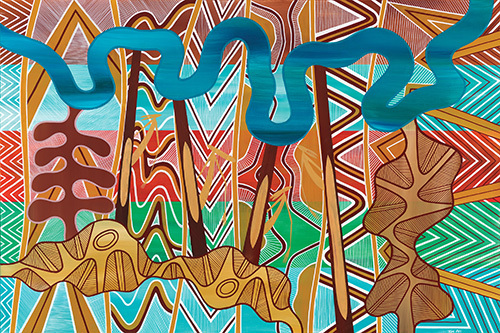 The Yalukit Willam (the ‘River people’) are a Boonwurrung clan and they were the most intimately connected with this area. For the Yalukit Willam, the river was a life force: it was central to their lives and their livelihoods. Other clans also moved through this area, and a number of clans had a meeting and camping place on the nearby rise that European settlers named ‘Emerald Hill’. Many clans would also meet together on other spots along the Yarra River. 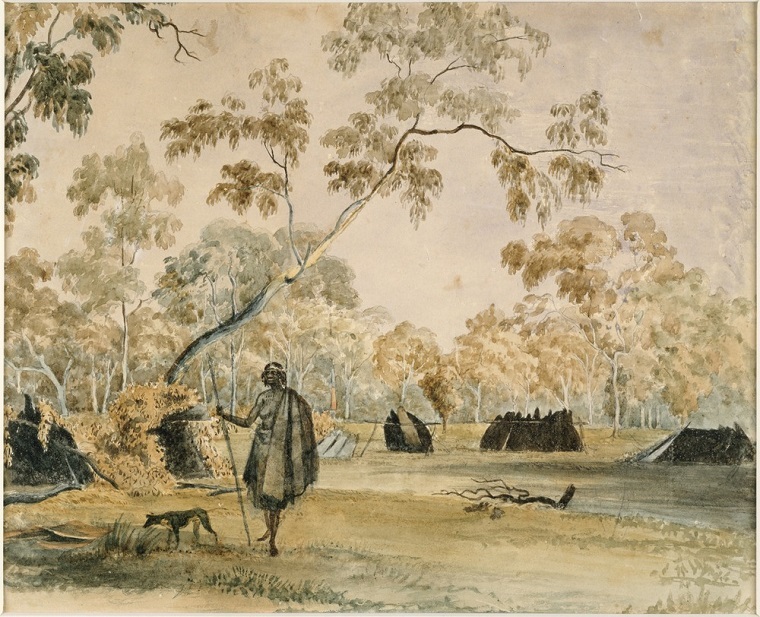 When Charles Grimes and his party ventured up the Yarra in 1803 they observed ‘native huts’, a canoe, and noted a bar across the river that was used by Aboriginal people for fishing.